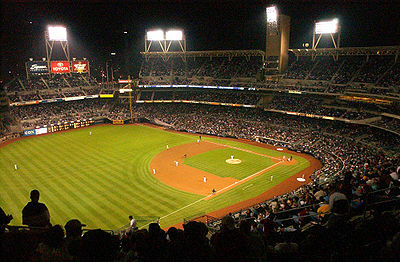 The baseball diamond of the San Diego Padres' Petco Park, seen from the left field stands. A baseball field, also called a ball field, sandlot or a baseball diamond, is the field upon which the game of baseball is played. The term can also be used as a metonym for a baseball park. Unless otherwise noted, the specifications discussed in this section refer to those described within the Official Baseball Rules, under which Major League Baseball is played. 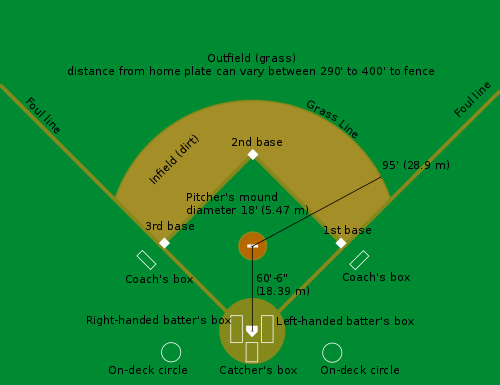 Diagram of a baseball field. The starting point for much of the action on the field is home plate (officially "home base"), which is a five-sided slab of whitened rubber, 17 inches (43 cm) square with two of the corners removed so that one edge is 17 inches long, two adjacent sides are 8.5 inches (22 cm) and the remaining two sides are 12 inches (30 cm) and set at an angle to make a point. The plate is set into the ground such that its surface is level with the surrounding ground. Adjacent to each of the two parallel 8.5-inch sides is a batter's box. The point of home plate where the two 12-inch sides meet at right angles is at one corner of a 90-foot (27.43 m) square. The other three corners of the square, in counterclockwise order from home plate, are called first, second, and third base. Three canvas or rubber bases 15 inches (38 cm) square and 3–5 inches (7.6–12.7 cm) in thickness made of soft material mark the three bases. Near the center of the square is an artificial hill known as the pitcher's mound, atop which is a white rubber slab known as the pitcher's plate, colloquially the "rubber." The specifications for the pitcher's mound are described below. All the bases, including home plate, lie entirely within fair territory. Thus, any batted ball that touches those bases must necessarily be in fair territory. While the first and third base bags are placed so that they lie inside the 90-foot square formed by the bases, the second base bag is placed so that its center (unlike first, third and home) coincides exactly with the "point" of the ninety-foot square. Thus, although the "points" of the bases are 90 feet apart, the physical distance between each successive pair of base markers is closer to 88 feet (26.8 m). The lines from home plate to first and third bases extend to the nearest fence, stand or other obstruction and are called the foul lines. The portion of the playing field between (and including) the foul lines is fair territory; the rest is "foul territory." The area within the square formed by the bases is officially called the infield, though colloquially this term also includes fair territory in the vicinity of the square; fair territory outside the infield is known as the outfield. Most baseball fields are enclosed with a fence that marks the outer edge of the outfield. The fence is usually set at a distance ranging from 300 to 420 feet (90 to 130 m) from home plate. Most professional and college baseball fields have a right and left foul pole. These poles are at the intersection of the foul lines and the respective ends of the outfield fence and, unless otherwise specified within the ground rules, lie in fair territory. Thus, a batted ball that passes over the outfield wall in flight and touches the foul pole is a fair ball and the batter is awarded a home run. First base is the first of four bases that must be touched by a player on the batting team in order to score a run. Unlike when an offensive player reaches second or third base, it is permissible for a batter-runner to overrun first base without being in jeopardy of being put out. After contact is made with the base, the batter-runner may slow down and return to first base at his leisure, so long as he makes no move or attempt to advance to second base. The first baseman is the defensive player responsible for the area near first base. A professional first baseman is often a slow runner and tall. A tall first baseman presents a large target to which other fielders can throw, and his height gives him a larger range in reaching and catching errant throws. Players who are left-handed are marginally preferable for first base because: first, it is easier for a left-handed fielder to catch a pick-off throw from the pitcher and tag the baserunner; and, second, it is easier for a left handed thrower to make the throw to second base to start a 3–6–3, 3–6–4, or a 3–6–1 double play. Also, a right-handed first baseman must, when setting himself up to receive a throw from an infielder, execute a half-pivot near the base; this is a move that a left-hander need not make (this advantage is very marginal, however). There are three infield positions that can only effectively be occupied by right-handed players: 2nd base, 3rd base, and shortstop. This is because of the time it takes to pivot and set to throw. It takes a left-handed thrower more time to make that pivot and in the fast-paced major league game, that time is critical. As a result, there are fewer positions a left-handed player can occupy, and if that player is not fast, the outfield may not be a good fit. In the numbering system used to record defensive plays, the first baseman is assigned the number 3. Second base is the second of four stations on a baseball diamond which must be touched in succession by a base runner in order to score a run for that player's team. Second base is typically defended by the second baseman and the shortstop. Second base is also known as the keystone sack. A runner on second base is said to be in "scoring position," owing to the high likelihood of reaching home plate and scoring a run from second base on most base hits. Since second is the farthest base from home plate, it is the most common target of base stealing. Ideally, the second baseman and shortstop possess quick hands and feet and the ability to release the ball rapidly and with accuracy. One will usually cover second base when the other attempts to field the ball. Both players must communicate well to be able to make a double play. Particular agility is required of the second baseman in double play situations, which usually forces the player to throw towards first while his momentum carries him in the opposite direction. In the numbering system used to record defensive plays, the second baseman is assigned the number 4, and the shortstop 6. Andy Wilkins rounds third base following a home run for the 2010 Arkansas Razorbacks baseball team. Third base is the third of four bases a base runner must touch in a counterclockwise succession in order to score a run. Many batted balls that result in the batter being put out (such as a sacrifice fly) may nevertheless allow a runner to reach home plate and score a run from third base, provided that the third and final out is not recorded before he can do so. A runner on third base is therefore particularly valuable to the batting team when fewer than two outs have been recorded. The third baseman is the defensive player whose responsibility is to defend the area nearest to third base. A third baseman ideally possesses quick reaction to batted balls and a strong arm to make the long throw to first base. The distance from 3rd to 1st is about 127 feet (39 m). In the numbering system used to record defensive plays, the third baseman is assigned the number 5. "Home plate" redirects here. For other uses, see Home plate (disambiguation). Home plate, formally designated home base in the rules, is the final base that a player must touch to score. Unlike the other bases, home plate is a five-sided slab of whitened rubber that is set at ground level. The use of rubber was developed by Robert Keating, who pitched one game for the 1887 Baltimore Orioles. Previously the plate was made of stone, iron, or wood. The dimensions of home plate are 17 inches (43 cm) across the front, 8.5 inches (22 cm) down each side, with a triangular rear of two sides of 12 inches (30 cm). The rear edges are at 45 degrees to the sides, making a point at the back. The plate is white and surrounded by a black strip 3⁄4 inch (1.9 cm) in width. The plate sits entirely in "fair" territory, with the two rear edges aligned with the right and left field foul lines. The length and angle requirements for home plate mandate that it is not a regular pentagon; it is a 17 by 8.5 inches rectangle with an isosceles triangle of base 17 inches and equal sides of 12 inches attached to the back. 50 to 100 feet (15 to 30 meters) behind home plate is the backstop, which is a wall/fence that will stop wild pitches, passed balls, and foul balls. In enclosed stadiums, the backstop is often composed of a lower part, which is like any other part of the wall, and an upper netting to protect spectators seated behind it; in recreational baseball fields, there is usually a tall chain-link fence, including an angled top section, composing the entire backstop. David Ortiz (in gray) of the Boston Red Sox stands in the left-handed hitters' batter's box at U.S. Cellular Field against the Chicago White Sox on July 7, 2006. The batter's box is the place where the batter stands when ready to receive a pitch from the pitcher. It is usually drawn in chalk on the dirt surrounding home plate, and the insides of the boxes are watered down before each game. The chalk lines delineating the two foul lines are rarely extended through the batter's boxes. However, those lines exist conceptually for the purpose of judging a batted ball fair or foul. In addition, inside edges of the batter's boxes are often not laid-in with chalk. Similarly, though not marked, those lines continue to exist for the purpose of the rules pertaining to the batter's box and the batter's position relative thereto. There are two batter's boxes, one on each side of home plate. The batter's boxes are 4 feet (1.22 m) wide and 6 feet (1.83 m) long. The batter's boxes are centered lengthwise at the center of home plate with the inside line of each batter's box 6 inches (15 cm) from the near edge of home plate. A right-handed batter would stand in the batter's box on the left side of home plate from the perspective of the catcher and umpire. A left-handed batter would stand in the batter's box to their right. A batter may only occupy one batter's box at a time and may not legally leave the batter's box after the pitcher has come set or has started his windup. Should the batter wish to leave the batter's box once the pitcher has engaged the rubber, he must first ask the umpire for time-out. Time will not be granted if the pitcher has already started his pitching motion. For playing rules relating to the batter's box, see Rules 6.05 and 6.06 of the Official Baseball Rules. One of two foul poles at Citizens Bank Park, Philadelphia. Foul poles, if present, help umpires judge whether a fly ball hit above the fence line is foul (out of play) or fair (a home run). The poles are a vertical extension of the foul lines at the edge of the field of play. The outer edge of the foul lines and foul poles define foul territory. Both the lines and the poles are in fair territory, in contrast to American football and basketball, where the lines marking the playing boundaries are out of bounds. The minimum distance to hit a home run (along either foul line) is set by baseball rules, generally at 325 feet (99 m). Before 1920, the foul lines extended indefinitely; a batter was awarded a home run only if a fly ball out of the field was fair where it landed, or "when last seen" by the umpire. Now, a batted ball that leaves the field in flight is judged fair or foul at the point it leaves the field. Thus, such a fly ball passing on the fair side of a foul pole, or hitting a foul pole, is a home run regardless of where the ball goes thereafter. Foul poles are typically much higher than the top of the outfield fence or wall, and often have a narrow screen running along the fair side of the pole. This further aids the umpires' judgment, as a ball that bounces off this screen is a home run. It can still be a difficult call, especially in ballparks with no outfield stands behind the poles to provide perspective. Wrigley Field is notorious for arguments over long, curving flies down a foul line (most notably in left field) that sail higher than the foul pole. At Major League Baseball fields, foul poles are usually yellow. Those at Citi Field are orange. At the Rogers Centre, there are no foul poles, but large nets suspended from the roof that serve the same purpose. At Petco Park, there is no foul pole in left field; the pole's function is served by a yellow metal strip along the corner of the Western Metal Supply Co. building. The pitcher moves forward off the rubber as the pitch is released. In roughly the middle of the square, equidistant between first and third base, and a few feet closer to home plate than to second base, is a low artificial hill called the pitcher's mound. This is where the pitcher stands when throwing the pitch. Atop the mound is a white rubber slab, called the pitcher's plate or pitcher's rubber. It measures 6 inches (15 cm) front-to-back and 2 feet (61 cm) across, the front of which is exactly 60 feet 6 inches (18.44 m) from the rear point of home plate. This peculiar distance was set by the rule makers in 1893, not due to a clerical or surveying error as popular myth has it, but intentionally (further details under History). In Major League Baseball, a regulation mound is 18 feet (5.5 m) in diameter, with the center 59 feet (18 m) from the rear point of home plate, on the line between home plate and second base. The front edge of the pitcher's plate or rubber is 18 inches (46 cm) behind the center of the mound, making the front edge's midpoint 60 feet 6 inches from the rear point of home plate. Six inches (15 cm) in front of the pitcher's rubber the mound begins to slope downward. The top of the rubber is to be no higher than ten inches (25 cm) above home plate. From 1903 through 1968, this height limit was set at 15 inches (38 cm), but was often slightly higher, sometimes as high as 20 inches (51 cm), especially for teams that emphasized pitching, such as the Los Angeles Dodgers, who were reputed to have the highest mound in the majors. A pitcher will push off the rubber with his foot in order to gain velocity toward home plate when pitching. In addition, a higher mound generally favors the pitcher. With the height advantage, the pitcher gains more leverage and can put more downward velocity on the ball, making it more difficult for the batter to strike the ball squarely with the bat. The lowering of the mound in 1969 was intended to "increase the batting" once again, as pitching had become increasingly dominant, reaching its peak the prior year; 1968 is known among baseball historians as "The Year of the Pitcher." This restrictive rule apparently did its job, contributing to the hitting surge of modern baseball. A pitcher's mound is difficult for groundskeepers to maintain. Usually before every game it is watered down to keep the dust from spreading. On youth and amateur baseball fields, the mound may be much different from the rule book definition due to erosion and repair attempts. Even in the major leagues, each mound gains its own character, as pitchers are allowed to kick away pieces of dirt in their way, thereby sculpting the mound a bit to their preference. The pitcher may keep a rosin bag on the rear of the mound to dry off his hands. Major League Baseball teams are also permitted cleat cleaners on the back of the mound. This may be a flat grate-style plate, or simply a hand tool such as a piece of wood used to remove mud and dirt from cleats. These items are allowed to remain on the backside of the mound at the discretion of the umpire, thus reducing the probability that they will affect a live play. A baseline is the straight line between two adjacent bases. Baselines are not drawn on the field, although the foul lines serve to mark the baseline between home plate and first base, and between third base and home. Generally, base runners are not required to follow the baseline. A base runner seeking to advance more than one base typically "rounds" the base, following a more circular path. However, a base runner's left-right motion is constrained when the defense tries to tag him. At the moment the defense begins the attempt, the baserunner's running baseline is established as a direct line from his current position to the base he is trying for. A runner straying more than three feet (1 m) away from this baseline to avoid a tag may be called out. Beginning halfway between home and first base, and ending at first base, there is a second chalk line to the right of the foul line. This second line and the part of the foul line it runs parallel to, form the running lane that defines the path in which a batter-runner must run as he is advancing to first base. Rule 6.05(k) of the Official Baseball Rules states that, if a batter-runner running to first base runs outside the running lane, and "in doing so" interferes with the fielder taking the throw at first, then the batter-runner is automatically out. First base itself is not located in the running lane, but Rule 6.05 lets the batter-runner leave the running lane "by means of a step, stride or slide in the immediate vicinity of first base" to step on first base. The Hubert H. Humphrey Metrodome, showing a white "grass" line. The grass line, where the dirt of the infield ends and the grass of the outfield begins, has no special significance to the rules of the game, but it can influence the outcome of a game. Dirt running paths between the bases (and, at one time and still in some parks, between the pitcher and the catcher) have existed since the beginning of the game, although they were not mentioned in the rule books until around 1950, and their specifications are flexible. In addition to providing a running path, the grass lines act as a visual aid so that players, umpires and fans may better judge distance from the center of the diamond. Occasionally the ball may take a tricky bounce off the dirt area or the edge between the dirt and the grass. Multiple World Series championships (including 1924, 1960 and 1986) have been decided or heavily influenced by erratic hops of ground balls. In artificial turf stadiums, infield dirt was originally only placed around the bases and around the pitcher's and batting areas, which are referred to as "sliding pits." In this configuration, the "grass line" is usually designated with a white arc. Among Major League Baseball fields, Rogers Centre was the last stadium to maintain this type of configuration and was reconfigured with a full dirt infield starting in the 2016 MLB season. In some college baseball parks with artificial turf fields, the entire field (along with possibly the pitcher's mound) is made up of turf, with parts of the field mainly containing dirt instead merely being clay-colored turf. The outfield is made from thick grass or artificial turf. It is where the outfielders play. The positions to play in the outfield are left, center, and right field (named in relation to the batter's position; thus left field is beyond third base and right field is beyond first base). Outfields vary in size and shape depending on the overall size and shape of the playing field. The outfield stretches from the infield to the outfield wall and it contains the warning track. Outfields especially vary from Little League to Major League fields. Little League outfields vary more in size than Major League outfields. Outfields often differ from infields in the specific type of grass used, but most Major League outfields are grass. The warning track is the strip of dirt at the edges of the baseball field (especially in front of the home run fence and along the left and right sides of a field). Because the warning track's color and feel differ from the grass field, a fielder can remain focused on a fly ball near the fence and measure his proximity to the fence while attempting to catch the ball safely. A warning track's width is not specified in the rules. It is generally designed to give about three steps of warning to the highest-level players using the field. Typical widths run from about six feet for Little League fields to about 10–15 feet (3.0–4.6 meters) for college- or professional-level play. A warning track this wide also lets groundskeepers avoid driving maintenance vehicles on the grass. The track can be composed of finely ground rock particles such as cinders, which is why announcer Bob Wolff called it the "cinder path" rather than the "warning track." The idea of a warning track originated in Yankee Stadium, where an actual running track was built for use in track and field events. When ballpark designers saw how the track helped fielders, it soon became a feature of every ballpark. Single-minded fielders often crash into a wall trying to make a catch despite the warning track. For this reason, outfield walls are typically padded for extra safety. Wrigley Field's brick wall is covered only by ivy, which is not especially soft. However, there are pads on the walls of the tight left and right field corners in foul ground. Warning-track power is a derogatory term for a batter who seems to have just enough power to hit the ball to the warning track for an out, but not enough to hit a home run. The term more generally refers to someone or something that is almost but not quite good enough for something. The Green Monster in 2006, showing the manual scoreboard and Green Monster seating, and more recent additions, including charity advertisements along the top, billboards above the Green Monster seating, and the American League East standings. The outfield wall or outfield fence is the wall or fence that marks the outer boundary of the outfield. A ball passing over the wall is dead; if it passes over the wall in fair territory while in flight, it is a home run. The official rules do not specify the shape, height, or composition of the wall, or a specific mandatory distance from home plate (though Major League Baseball mandates a minimum distance of 250 feet (76 m) and recommends a minimum distance of 320 feet (98 m) at the foul poles and 400 feet (120 m) at center field). As a result, baseball fields can vary greatly along those lines. The wall has numbers affixed or painted on it that denote the distance from that point on the wall to home plate. In most modern major league ballparks, the wall is made of some hard material (e.g., concrete, plywood, sheet metal) with padding on the field side to protect players who may collide with the wall at high speed while trying to make a play. Chain link fencing may also be incorporated into the wall in areas where the wall needs to be transparent, e.g., an outfield bullpen, a spectator area behind the wall, or to protect a scoreboard incorporated into the wall. Many ballparks feature a yellow line denoting the top of the wall to aid umpires in judging whether the ball passed over the wall or if the ball is fair or foul. The bullpen (sometimes referred to as simply "the 'pen") is the area where pitchers warm up before entering a game. Depending on the ballpark, it may be situated in foul territory along the baselines or just beyond the outfield fence. Relief pitchers usually wait in the bullpen when they have yet to play in a game, rather than in the dugout with the rest of the team. The starting pitcher also makes his final pregame warmups in the bullpen. Managers can call coaches in the bullpen on an in-house telephone from the dugout to tell a certain pitcher to begin his warmup tosses. "Bullpen" is also used metonymically to describe a team's collection of relief pitchers. There are two on-deck circles in the field, one for each team, positioned in foul ground between home plate and the respective teams' benches. They are technically known as next-batter's boxes. The on-deck circle is where the next scheduled batter, or "on-deck" batter, warms up while waiting for the current batter to finish his turn. The on-deck circle is either an area composed of bare dirt; a plain circle painted onto artificial turf; or often, especially at the professional level, a mat made from artificial material, with the team or league logo painted onto it. The coach's boxes, located behind first and third base, are where the first and third base coaches are supposed to stand, although coaches often stand outside the box. This is permissible as long as the coach does not interfere with play and the opposing team does not object (in which case the umpire shall ensure that all coaches on both teams must abide by the boundaries of the coach's boxes). The coach's boxes are marked with chalk or paint. In the early days of baseball, the term "coacher's box" was used, as "coach" was taken to be a verb. As the term "coach" evolved into a noun, the name of the box also changed. The basic layout of the diamond has been little changed since the original Knickerbocker Rules of the 1840s. The distance between bases was already established as 90 feet (27.43 m), which it remains. Through trial and error, 90 feet had been settled upon as the optimal distance. 100 feet would have given too much advantage to the defense, and 80 feet too much to the offense. The original Knickerbocker Rules did not specify the pitching distance explicitly. By the time major league baseball began in the 1870s, the pitcher was compelled to pitch from within a "box" whose front edge was 45 feet (14 m) from the "point" of home plate. Although he had to release the ball before crossing the line, as with bowlers in cricket, he also had to start his delivery from within the box; he could not run in from the field as bowlers do. Furthermore, the pitcher had to throw underhand. By the 1880s, pitchers had mastered the underhand delivery—in fact, in 1880, there were two perfect games within a week of each other. Many sources suggest that the pitching distance evolved from 45 to 50 to 60.5 feet. However, the first two were the "release point" and the third is the "pushoff point," so the 1893 increase was not quite as dramatic as is often implied; that is, the 1893 rule change added only 5 feet to the release point, not 10.5 feet. Originally the pitcher threw from flat ground, but over time the raised mound was developed, somewhat returning the advantage to the pitchers. Before the mid-20th century, it was common for baseball fields to include a dirt pathway between the pitcher's mound and home plate. This feature is sometimes known as the "keyhole" due to the shape that it makes together with the mound. The keyhole was once as wide as the pitcher's box and resembled a cricket pitch. Sometimes this path extended through the batting area and all the way to the backstop. Once the rounded pitcher's mound was developed, the path became more ornamental than practical, and was gradually thinned before being largely abandoned by the 1950s. In recent years some ballparks, such as Comerica Park and Chase Field in the major leagues, have revived the feature for nostalgic reasons. The Sports Turf Managers Association (STMA) presents various awards each year. Starting in 2001, its Sports Turf Manager of the Year Awards have been presented annually in the Triple-A, Double-A, Class A, and Short-Season/Rookie divisions of Minor League Baseball and are chosen from the 16 league winners. STMA also presents the Baseball Field of the Year Award, which includes Schools and Parks, College/University and Professional categories. ^ a b "Official Rules: 1.00 Objectives of the Game". Major League Baseball. Retrieved 26 October 2014. ^ "DIAGRAM NO 2". Official Rules of Major League Baseball, 2013 Edition (PDF). Triumph Books. p. 5. ISBN 978-1-60078-797-3. ^ James, B. New Historical Baseball Abstract. ^ "Field Dimensions". MLB.com. Retrieved March 5, 2018. ^ "Official Rules". Major League Baseball. Retrieved 14 October 2015. ^ Mahony, Phillip (2014). Baseball Explained. McFarland Books. ^ "Toronto Blue Jays' new dirt infield under construction at Rogers Centre". CBC.ca. February 10, 2016. ^ "Major League Baseball Ballpark Grass and Turf". www.baseballpilgrimages.com. Retrieved 2018-03-06. ^ "Lee Richmond Perfect Game Box Score by Baseball Almanac". 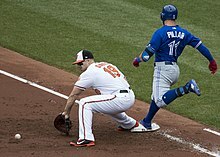 baseball-almanac.com. Retrieved 14 October 2015. ^ a b Lansch, Jerry. Glory Fades Away. ^ "Turf award winners named: Stevenson, Parrott, Tanis, Hall are classification winners". Florida State League official website. Minor League Baseball. November 21, 2011. Retrieved 2012-01-01. [T]he STMA [Sports Turf Managers Association] began recognizing sports turf managers in 2001. Wikimedia Commons has media related to Baseball fields. This page was last edited on 4 February 2019, at 01:30 (UTC).